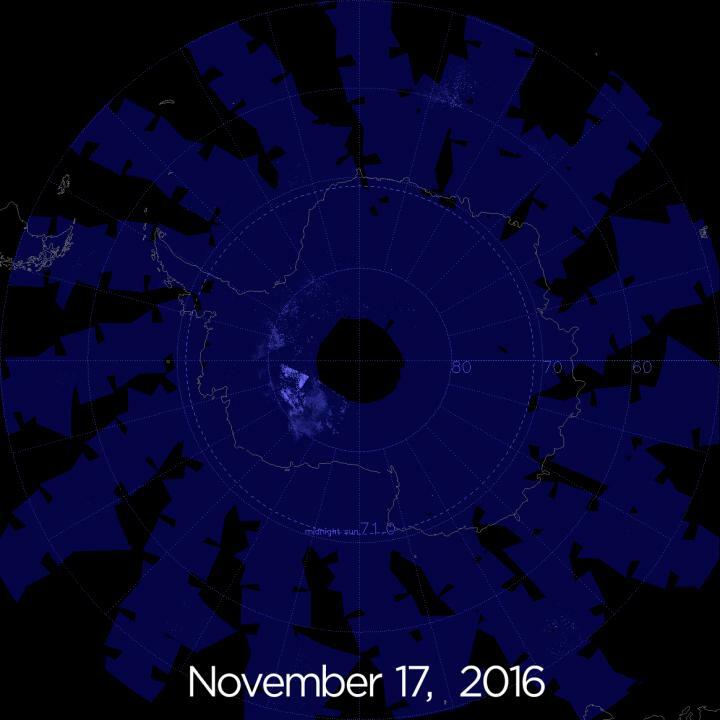 NASA’s Aeronomy of Ice in the mesosphere has captured data showing “noctilucent clouds” in the sky over the South Pole. This peculiar clouds came on early this year, according to AIM data. The first images collected of the clouds were taken on Nov 17, marking the earliest occasion in which this phenomenon has appeared in the last decade. Recordings of noctilucent clouds usually start in late November or early December. According to studies published by AIM, there is an event called “atmospheric teleconnections” that affects all the phenomenons reported in each studied area. “Data from NASA’s Aeronomy of Ice in the Mesosphere, or AIM, spacecraft shows the sky over Antarctica is glowing electric blue due to the start of noctilucent, or night-shining, cloud season in the Southern Hemisphere,” NASA Goddard Space Flight Center was quoted as saying in a press release. Data show that circumstances that are happening in one region can have repercussions in a different region, no matter the distance. Therefore, NASA explains how there is an evolution on the orbit of the spacecraft due to natural precession, making easier to recollect and measure the atmospheric gravity waves that might be affecting those atmospheric teleconnections. This sky phenomenon is quite young, according to scientists. The first reports of noctilucent clouds are from 1885, Gary Thomas, a professor at the University of Colorado, stated. Noctilucent clouds are the highest cloud formation in Earth’s sky and are located 50 miles above the ground. They are specifically in a sky layer called mesosphere and are formed by ice crystals. These clouds cannot be seen easily by the human eye because the sun has to be below the horizon for the observer but there still has to be presence of sunlight. Scientists explained that because of a series of complex seasonal changes regarding lower altitudes, the noctilucent cloud season started earlier this year. Image credit: NASA. “Noctilucent clouds are a relatively new phenomenon. They were first seen in 1885, about two years after the powerful eruption of Krakatoa in Indonesia, which hurled plumes of ash as high as 80 km into Earth’s atmosphere,” he said in an article about the spacecraft’s mission AIM, short time after its start. Noctilucent clouds appear in summer season primarily, specifically in the North and the South Pole. During this time, the mesosphere layer is most humid and it is also the coldest place on Earth, with temperatures around minus 210 degrees Fahrenheit. 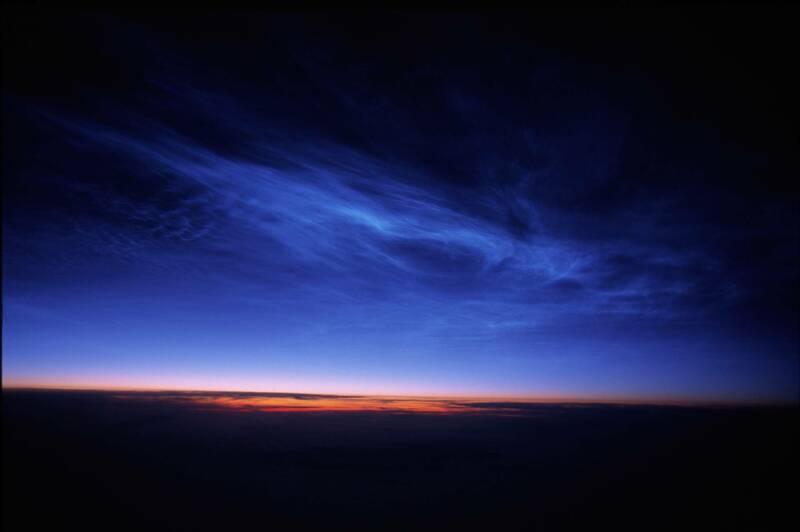 The AIM project has as main objective studying noctilucent clouds in order to accomplish a better understanding of mesosphere behavior, climate and weather. This satellite launched in 2007. It is the ninetieth NASA exploration and research mission, as part of the Small Explorer Program (SMEX). Right now it is orbiting at an altitude of 370 miles (600 km) and has spent six years collecting vital information regarding atmospheric studies. The AIM mission is directed by the Goddard Space Flight Center in Greenbelt, Maryland. It is also being oriented by a team of scientists from the Center for Atmospheric Sciences at Hampton University in Hampton, Virginia.